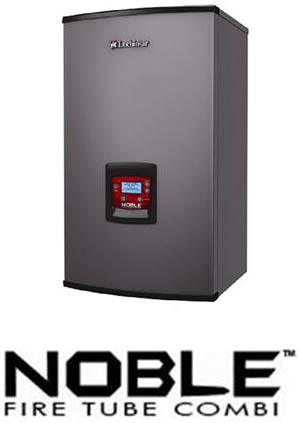 The NOBLE™ combi boiler provides a space-saving choice for builders and specifiers, lowering installation costs by reducing the mechanical equipment needed to provide rapid, reliable hot water supply and efficient space heating. It also gives plumbing contractors a money-saving alternative for single family housing with 1 or 2 bathrooms. 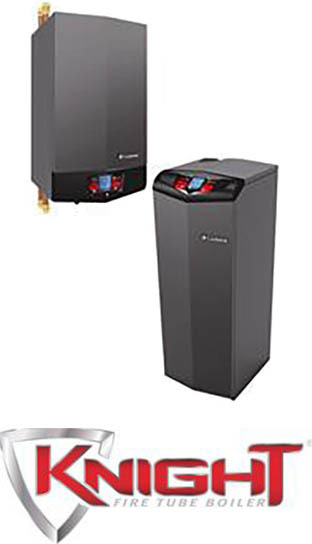 The KNIGT wall mount fire tube boiler allows for a more flexible installation with top and bottom water connections**. Multiple water connection locations add flexibility by allowing boiler connections to be as close as possible to the system piping, reducing installation cost, complexity and the amount of piping needed for a job. The KNIGHT® floor-standing fire tube-boiler features reduced installation footprint for flexibility in boiler placement. Plus, all connections are on the top and left side, so KNIGHT is an easy drop-in replacement for older, less efficient boilers. Six models offer inputs from 55,000 to 285,000 Btu/hr.